Home > Blog > Ride on! There are a million reasons to go to summer camp. You might love the idea of being immersed in nature, or maybe the thrill of being away from home is what interests you. There’s the chance to make a hundred friends and develop your sense of self-reliance. Or maybe it’s just all the fun you’ll have. Fun can mean different things to different people, but if you’re a camper at Black River Farm & Ranch Camp, chances are you find the most fun when you’re riding. Since 1962, this 360-acre farm and ranch in Croswell, Michigan has provided young women with a five acre lake, natural woodlands, a valley with a winding stream, and the fields of the River Bend Farm to give them the best of experience a camp can offer. If you’re horse-crazy, then this is the camp for you. Black River Farm & Ranch campers regularly head out on trail rides, they take mounted and ground lessons, lessons for vaulting (a.k.a. gymnastics on horseback) and are given free riding time under supervision. With more than 85 horses, Black River Farm & Ranch offer the best ratio of horses to campers. 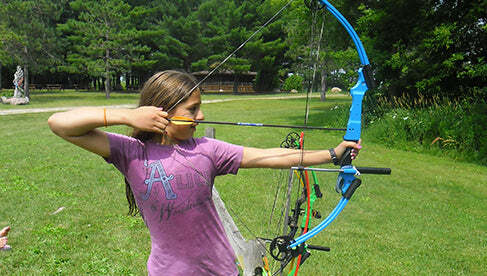 Other fun things to do at the Farm & Ranch are Archery Tennis, Basketball, Crafts, Swimming, Paddle boats, and plenty more. After the sun goes down, crazy games and programs are held across the entire camp in order to bring everybody together for the excitement and fun. Black River Farm & Ranch has excellent bunk houses—or, ‘cities’, as they’re called at the Farm & Ranch—each one consisting of three to four cabins. And, in each cabin, you’ll find all the amenities and bunks to comfortably house 8 to 12 girls and their belongings. If you love, love, love horses, then look closely at Black River Farm & Ranch. It may be the right summer camp experience for you! Check out their website right here and, as always, thanks for reading!